Detailed Description: Schneider Electric/Square D Multi 9™ 1-Pole Supplementary protector has a voltage rating of 277 Volts and current rating of 5 Amps. Protector has interrupt rating of 10 kilo-Amps at 120/480/277 VAC and 20 kilo-Amps at 240 VAC at 50/60 Hz. It has single-barrel lugs with binding screws to accommodate two 18 - 10 AWG wires. Single-barrel lugs terminals offer superior finger safe ingress protection and eliminate incidental contact with live circuit breaker components. Protector has fast closing feature to resist high inrush currents of some loads. It features C curve trip mechanism to prevent contacts to be in I-ON position during automatic tripping. Green mechanical indication on front face of the circuit breaker indicates contact disconnection when all poles are open. Supplementary protector is ideally designed to offer superior overload and short circuit protection. It is perfect for reverse feeding and has padlock attachment that lets you lock in O-OFF position. 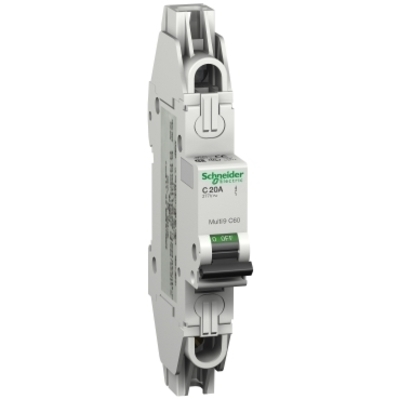 Protector prevents extra cost of spare fuses, blown fuse indicators and additional wiring. Protector has IP40 enclosure to offer superior durability. It has 35 mm DIN rail mounting to hold the breaker in place and offers easy installation. It measures 0.710 Inch x 2.760 Inch x 3.190 Inch. Supplementary protector is UL listed and CSA certified.